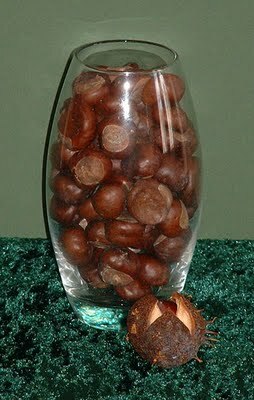 Yesterday my Wordless Wednesday picture was of this vase full of nuts and I promised I’d post an explanation. I was walking in Newsham Park in Liverpool a year ago. As I went under a Horse Chestnut tree a gust of wind brought a liberal shower of Horse Chestnuts down on me. Fortunately it was a chilly day so I had a thick hat on. The one at the front is new and shows what they looked like when they fell on me. I don’t know why but I collected them up – it seemed like the thing to do. I probably wasn’t thinking straight – I’d just been nutted by a load of nuts on my nut. I dried them out, got rid of a few bad nuts and put the 122 that remained in a glass vase from Woolworths. If I were a modern artist I’d sell them to a gallery and call it "What the sky looks like when it falls on your head"
The Common Horse Chestnut tree (Aesculus hippocastanum) was introduced to Britain from the Balkans in southern Europe in the 17th century. They have distinctive oval leaves. A typical mature Horse Chestnut tree is around 25m tall although some reach 35m. The nuts are inedible but much sought after by children. In Britain we call them Conkers and children play a game with them. Now the science bit: They weigh 0.6kg (1.3lbs) so the average conker is 0.05kg (0.01lbs). They have a volume of 0.55l or 0.0005m3 (0.12 imperial gallons 0.15 us gallons) giving an average volume of 0.0045lm3 or 4.5cm3 (0.001 imperial gallons 0.0012 us gallons) each. That gives a density of 1090kg/m3 (68.1lbs/ft3). Assuming the tree is 25m tall a conker falling from the top of the tree will take 2.3s to hit the ground. Assuming the conkers on average fell from half that height 1.6s to hit the ground. The velocity of that theoretical falling conker will be 16m/s (51ft/s) or 56km/h (35mph). The impact energy for our theoretical conker is 0.6J (0.8 foot-pound force). As a comparison the impact energy of a brick falling the same distance would be 370J (500 foot-pound force). Or if I was a journalist being hit by a conker is equivalent to being hit by two three millionths of an elephant falling out of a tree. I’ll take getting conked on my cranium by conkers over elephants any day. chestnuts make me think of Christmas....probably because of the song...nice post...and educational! smile. THanks for the explanation! Happy tt. Interesting idea for WW and TT! Oh your poor head. I love how you took this single event and got so creative with it. "Conkers." Heh. I've always wondered what they looked like. I've been hearing about them all my life, but if they grow in Florida, I don't know it. As noted, they look very nice in a vase...such a beautiful, shiny texture. Thanks for visiting Cockney Rob's T13 at our blog and sharing your insights...He needs all the help he can get, he says. Very interesting! My aunt has several chestnut trees on her property and her lawn is covered in them. :) Great TT! What a funny story. And with scientific asides! I love the fact that you collected the nuts. My daughter has a thing for rocks and will pick up little ones where ever she goes. And it could be modern art! Thnaks for the wonderful story. Happy TT! :) mine's up, too. Very interesting. We have trees like that here, too. I've always wondered about those nuts falling from the trees. Now I know! Thanks. What an original post. Great story and great word "Conkers". You know you can go your whole life without hearing a word, and then all of a sudden it comes up a lot? For me, that's Conkers. I looked it up after Paul McCartney referenced it in his new song, "That Was Me." Then I heard it in a documentary about London during WWII. And now this post! Wow, this was hilarious and so much fun to read!! That alas, explains the vase!! LOLOL! This is one of my favorite TTs ever -- so creative and funny. Well, I don't mean to say it's funny that you got ouched. But using your decidedly nutty experience as a TT is superduper! Wow. I've only ever had books fall on my head. Ouch! Some really great and clever writing in here, Mark. Impressive! There used to be three horse chestnut trees on my street, now there's only one; when I was out walking my dog tonight, I just happened to pick up two chestnuts thinking maybe I could start a seedling from them! Very interesting! Great T13! Mine is up too! What a great story...lol...they look beautiful in that vase. Happy TT.